This Lease (“Lease”) is made as of _________________, by and among COMMERCIAL PROPERTY LANDLORD, INC., a __________________ corporation (“Landlord”), and AGREEABLE TENANT, INC., a _________________ corporation (“Tenant”), and COMMERCIAL DEVELOPMENT PARTNERS (“Developer”). A. Landlord, for and in consideration of the rents, covenants and agreements hereinafter contained, hereby leases, rents, lets and demises unto Tenant, and Tenant does hereby take and hire, upon and subject to the conditions and limitations hereinafter expressed, all that approximately ___ acre parcel of land situated in the _____________ County Business Park ("PARK") in the City of _____________ ("CITY"), County of _____________, State of _____________, described in EXHIBIT A attached hereto and made a part hereof (the "LAND"), together with all improvements located on and to be constructed thereon pursuant to the terms and conditions hereof. The initial improvements to be constructed on the Land on behalf of Landlord by Contractor (as hereafter defined), in accordance with the Initial Improvement Final Plans and Specifications (as hereafter defined) and as provided in the Work Letter attached to this Lease as EXHIBIT 2.1 hereof, shall consist of approximately __________ square foot warehouse/distribution and office facility containing approximately ________ square feet of office space, and the other improvements provided in the Initial Improvements Final Plans and Specifications which are collectively referred to as the "INITIAL IMPROVEMENTS." The improvements, if any, to be constructed by Landlord pursuant to Tenant's right to expand as provided in Article 2A hereof are referred to as the "EXPANSION SPACE." B. Improvements, Expansion Space and all other improvements, machinery, equipment, fixtures and other property, real, personal or mixed, except those items of Tenant's attached or unattached personalty, which are deemed to be Trade Fixtures (as provided in Article 16, the "TRADE FIXTURES") installed or located thereon, together with all additions, alterations and replacements thereof are collectively referred to as the "IMPROVEMENTS." The Land, Improvements and any alterations, modifications or additions thereto are hereafter collectively referred to as the "DEMISED PREMISES." The structure located upon and forming a part of the Demised Premises which are constructed for human occupancy or for storage of goods, merchandise, equipment, or other personal property is collectively called the "BUILDING." C. For the purposes of Tenant's financial reporting, it is the intent of Landlord and Tenant that this Lease constitute an operating lease pursuant to generally accepted accounting principles, consistently applied, existing as of the date of this Lease. D. All defined terms are defined in this Lease or in the Work Letter attached hereto, and incorporated herein by reference. SECTION 1.1 INITIAL TERM. The initial term of this Lease ("INITIAL TERM") shall be for fifteen (15) years (subject to renewal thereof as described in Section 1.4 hereof). The Initial Term shall commence on the Initial Term Commencement Date (as hereafter defined), and end, except for the Expansion Extension, if any, at 11:59 P.M. local time of the Demised Premises, on the date which is fifteen (15) years after the Initial Term Commencement Date ("INITIAL TERM TERMINATION DATE"). 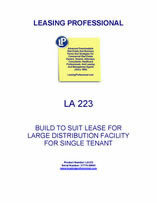 If Tenant exercises its option provided in Article 2A hereof to cause Landlord to plan, design and construct and add to the Demised Premises the Expansion Space, the Initial Term shall nonetheless commence on the Delivery Date (as hereafter defined) or on the date the Delivery Date would have occurred, but for Tenant Extensions (as hereafter defined), and shall be for the period that is the longer of and the Initial Term Termination Date shall occur (i) fifteen (15) years from and after the Delivery Date (or the date the Delivery Date would have occurred, but for Tenant Extensions), or (ii) ten (10) years from and after the Expansion Commencement Date (as hereafter defined) ("EXPANSION EXTENSION"). Notwithstanding the foregoing, if Tenant exercises its option for Tenant Performed Expansion Work (as defined and provided in Section 2A.2 hereof), there will be no Expansion Extension. Subject to Permitted Delays (as hereafter defined), (i) the Initial Improvements will be Substantially Complete (as hereafter defined) on and the Delivery Date will be ________ ("INITIAL TERM COMMENCEMENT DATE"), and (ii) except in the instance of the Expansion Extension, if any, the Initial Term Termination Date will be 11:59 P.M. local time of the Demised Premises on ___________. However, nothing in this Lease shall prevent the Initial Term Commencement Date from occurring prior to __________, but in no instance prior to ______________. The Initial Term Commencement Date and the Initial Term Termination Date are subject to adjustment as set forth in this Article 1 and in Section 2.2 hereof. SECTION 1.3 DELIVERY DATE; INITIAL TERM COMMENCEMENT DATE. The "DELIVERY DATE" shall be the date on which all of the Initial Improvements are Substantially Complete. However, anything in this Lease (including the Work Letter) to the contrary notwithstanding, in the event that (i) the Initial Improvements are not Substantially Complete, and (ii) if applicable, the Construction Arbitrator (as defined in the Work Letter) has certified that, as of a date certain set forth in such certification, the Initial Improvements would have been Substantially Complete, but for a Tenant Extension(s), then the Initial Term shall commence on the Initial Term Commencement Date that shall nonetheless be deemed to have occurred on the date certain set forth in the Construction Arbitrator's aforesaid certification. SECTION 1.4 OPTIONS TO RENEW. Subject to the terms, provisions and conditions of this Lease, Tenant shall have two (2) five (5)-year options to extend Tenant's rights under the terms of this Lease. In the event Tenant exercises either or both of such options to renew, the time period contained in each of the two (2) successive five (5) year periods thereafter shall be referred to, respectively, as the "FIRST RENEWAL TERM" and "SECOND RENEWAL TERM." The First Renewal Term and Second Renewal Term are sometimes hereinafter individually referred to as a "RENEWAL TERM," and are sometimes hereinafter collectively referred to as "RENEWAL TERMS." The Initial Term and any and all Renewal Terms are sometimes hereinafter collectively referred to as the "TERM." If applicable, the First Renewal Term shall commence on the day after the Initial Term Termination Date and the Second Renewal Term shall commence on the fifth anniversary of the date on which the First Renewal Term commenced. Except for modifications of Base Rent (as hereafter defined), and except as otherwise specifically provided herein, all of the other terms, provisions and conditions of this Lease shall apply during each Renewal Term exercised by Tenant as hereafter provided as and to the same extent as they apply during the Initial Term. SECTION 1.5 EXERCISE OF OPTIONS TO RENEW. If Tenant wishes to exercise its options for either of the Renewal Terms, it shall give written notice thereof ("RENEWAL NOTICE") to Landlord not later than twelve (12) months prior to the expiration, as applicable, of the Initial Term and the First Renewal Term. Tenant may give its Renewal Notice at any time prior to the dates above provided, but if Tenant shall fail to give its Renewal Notice prior to the applicable date above provided, it shall act as notice from Tenant to Landlord that Tenant has waived its right to elect to extend the Term for the applicable Renewal Term. It shall be a condition to the exercise and effectiveness of the extension of the Term for each Renewal Term that Tenant shall not be in Default (as hereafter defined) of any of the terms, provisions or conditions of this Lease, either at the time of delivery of the applicable Renewal Notice or at the commencement of the applicable Renewal Term; provided, however, that Landlord shall have the right, in its sole discretion, to waive any such Default for purposes of Tenant's exercise of the subject Renewal Term. Notwithstanding the foregoing, Tenant shall not be permitted to exercise its right to the Second Renewal Term, unless Tenant has exercised its right to the First Renewal Term. (xi) is governed by the International Standby Practices 1998, published by the International Chamber of Commerce. Subject to Section 1.6(b) hereof, the Letter of Credit (as transferred, extended, renewed or replaced) must be maintained during the entire Term, as extended or renewed, and for a period of seventy-five (75) days thereafter. (b) In the event at any time during the Term Tenant delivers written notice to Landlord, together with reasonable supporting documentation, that Tenant's corporate credit rating achieves a so-called "investment grade" for a continuous period of not less than twelve (12) months as determined by Standard & Poors Corporation, Moody's Investors Service, Inc. or any other nationally recognized rating agency if both of the foregoing cease to exist ("RATING AGENCY"), then the amount of the Letter of Credit may be reduced to one-twelfth of the annual Base Rent for the Initial Improvements, PLUS if applicable, one-twelfth of the annual Base Rent for the Expansion Space as provided in Section 1.6(k) hereof for the remainder of the Term. Tenant shall deliver to Landlord a replacement Letter of Credit for the reduced amount, but otherwise on the same terms and conditions provided in Section 1.6(a) hereof. Upon receipt by Landlord of such replacement Letter of Credit, Landlord shall deliver to Tenant the original Letter of Credit. (c) Landlord may freely transfer the Letter of Credit in connection with an assignment of this Lease without (i) Tenant's consent, (ii) restriction on the number of transfers, or (iii) condition, other than presentment to Issuer of the original Letter of Credit and a duly executed transfer document conforming in substance to the form attached as Exhibit B to the form of Letter of Credit that is attached hereto as EXHIBIT 1.6(a). Tenant is solely responsible for any bank fees or charges imposed by Issuer in connection with the issuance of the Letter of Credit or any transfer, renewal, extension or replacement thereof; provided, however, Tenant shall be required to pay any required transfer fee only in the case of a transfer in connection with the sale, conveyance or transfer of title of or to the Demised Premises and provided Tenant's obligation to so pay the transfer fees does not occur more frequently than once per calendar year. Subject to the foregoing, Landlord may, at its option and without notice to Tenant, elect to pay any transfer fees to Issuer when due, and upon payment, such amount will become immediately due and payable from Tenant to Landlord as Additional Charges (as hereafter defined) under this Lease. (v) Tenant holds over or remains in possession of the Demised Premises after the expiration of the Term or earlier termination of this Lease, without Landlord's consent. (iv) any and all other damage, injury, reasonable expense or liability caused to or incurred by Landlord as a result of any Default, Draw Event or other breach, failure or default by Tenant under this Lease. To the extent that Draw Proceeds exceed the amounts so applied, such excess Draw Proceeds will be deemed paid to Landlord to establish a credit on Landlord's books in the amount of such excess, which credit may be applied by Landlord thereafter, in Landlord's sole and absolute discretion, to any of Tenant's obligations to Landlord under this Lease as and when they become due. Following any use or application of the Draw Proceeds, if requested by Landlord in writing, Tenant must, within ten (10) business days (i.e. all calendar days, excluding Saturdays, Sundays and any national banking holidays in the State of _____________, are referred to as "BUSINESS DAY(S)") after receipt of Landlord's request, cause a replacement Letter of Credit to be issued and delivered to Landlord in accordance with, as applicable, Sections 1.6(a) or 1.6(b) hereof. Upon Landlord's receipt of the replacement Letter of Credit, Landlord will deliver the prior original Letter of Credit to Issuer for cancellation (if not theretofore fully drawn) and any unapplied Draw Proceeds will be applied in accordance with Sections 1.6(e)(i), 1.6(e)(ii), 1.6(e)(iii) and 1.6(e)(iv) hereof. If it is determined or adjudicated by a court of competent jurisdiction that Landlord was not entitled to draw on the Letter of Credit or apply any Draw Proceeds, Tenant may, as its sole and exclusive remedy, (i) cause Landlord to deliver the prior original Letter of Credit to Issuer for cancellation (if not theretofore fully drawn), and (ii) recover from Landlord the Draw Proceeds and all out-of-pocket fees (including reasonable attorneys' fees), costs and interest expenses actually incurred by Tenant as a direct result of Landlord's draw on the Letter of Credit or application of any Draw Proceeds; provided, however, that Tenant may exercise its exclusive remedy only after Tenant has caused a replacement Letter of Credit to be issued and delivered to Landlord in accordance with this Section 1.6. Anything in this Lease to the contrary notwithstanding, Landlord will not be liable for any indirect, consequential, special or punitive damages incurred by Tenant in connection with either a draw by Landlord on the Letter of Credit or the use or application by Landlord of the Draw Proceeds in the absence of gross negligence or willful misconduct by Landlord. Nothing in this Lease or in the Letter of Credit will confer upon Tenant any property right or interest in any Draw Proceeds. (f) The Letter of Credit must provide that it will be automatically renewed unless Issuer provides written notice of non-renewal to Landlord at least sixty (60) days prior to the expiration date of the Letter of Credit. If written notice of non-renewal is received from Issuer, Tenant must renew the Letter of Credit or replace it with a new Letter of Credit or a Cash Deposit, at least thirty (30) days prior to the stated expiration date of the then-current Letter of Credit. Any renewal or replacement Letter of Credit must meet the criteria set forth, as applicable, in Sections 1.6(a) or 1.6(b) hereof and have a term commencing at least one (1) day prior to the stated the expiration date of the immediately prior Letter of Credit. (g) If an Issuer Quality Event (as hereafter defined) occurs, upon thirty (30) days' prior written notice from Landlord, Tenant must, at Tenant's own cost and expense, provide Landlord with a replacement Letter of Credit meeting all of the requirements, as applicable, of Sections 1.6(a) or 1.6(b) hereof. The term "ISSUER QUALITY EVENT" means the quality of Issuer's creditworthiness ceases to be reasonably acceptable to Landlord. (h) Tenant expressly acknowledges and agrees that: (i) the Letter of Credit constitutes a separate and independent contract between Landlord and Issuer, and Tenant has no right to submit a draw to Issuer under the Letter of Credit; (ii) Tenant is not a third-party beneficiary of such contract, and Landlord's ability to either draw under the Letter of Credit for the full or any partial amount thereof or to apply Draw Proceeds may not be conditioned, restricted, limited, altered, impaired or discharged in any way by virtue of any laws to the contrary, including, without limitation, any laws which restrict, limit, alter, impair, discharge or otherwise affect any liability that Tenant may have under this Lease or any claim that Landlord has or may have against Tenant; (iii) Tenant's rights and obligations in connection with the Letter of Credit and any Draw Proceeds are as specified in this Section, and neither the Letter of Credit nor any Draw Proceeds will be or become the property of Tenant, and Tenant does not and will not have any property right or interest therein; (iv) Tenant is not entitled to any interest on any Draw Proceeds; (v) neither the Letter of Credit nor any Draw Proceeds constitute an advance payment of Base Rent, security deposit or rental deposit; (vi) neither the Letter of Credit nor any Draw Proceeds constitute a measure of Landlord's damages resulting from any Draw Event, Default or other breach, failure or default (past, present or future) under this Lease; and (vii) Tenant will cooperate with Landlord, at Tenant's own expense, in promptly executing and delivering to Landlord all modifications, amendments, renewals, extensions and replacements of the Letter of Credit, as Landlord may reasonably request to carry out the terms and conditions of this Section 1.6. (i) Tenant hereby irrevocably waives any and all rights and claims that it may otherwise have at law or in equity, to contest, enjoin, interfere with, restrict or limit, in any way whatsoever, any requests or demands by Landlord to Issuer for a draw or payment to Landlord under the Letter of Credit which conform to the requirements set forth herein. If Tenant, or any person or entity on Tenant's behalf or at Tenant's direction, brings any proceeding or action to contest, enjoin, interfere with, restrict or limit, in any way whatsoever, any one or more draw requests or payments under the Letter of Credit and the proceeding or action is decided adversely to Tenant, Tenant will be liable for any and all direct and indirect damages resulting therefrom or arising in connection therewith, including, without limitation, reasonable attorneys' fees and costs. (j) At any time during the Term, Tenant can elect, in its sole discretion, to substitute the Cash Deposit for the Letter of Credit, or after the substitution of the Cash Deposit for the Letter of Credit, the re-substitution of the Letter of Credit for the Cash Deposit and so on, back and forth, but in no event more than twice in any calendar year. If Tenant elects to substitute the Cash Deposit for the Letter of Credit, promptly following the delivery to Landlord of the Cash Deposit (in the amount required pursuant to Sections 1.6(a), 1.6(b) and 1.6(k) hereof, as applicable, Landlord shall deliver to Tenant the Letter of Credit then in effect. If Tenant elects to substitute the Letter of Credit for the Cash Deposit, promptly following the delivery to Landlord of the Letter of Credit (in the amount required pursuant to Sections 1.6(a), 1.6(b) and 1.6(k) hereof, as applicable, and on the terms provided in Section 1.6(a) hereof), Landlord shall deliver to Tenant the Cash Deposit (or the amount remaining thereof if Landlord made a permitted application thereof), plus all interest or gain earned thereon that was not previously paid to Tenant as hereafter provided in this Section 1.6. (k) In the event pursuant to Article 2A hereof, Tenant elects to have Landlord construct the Expansion Space, concurrently with the delivery of the Notice to Proceed (as hereafter defined), Tenant shall deliver to Landlord a replacement Letter of Credit in the amount provided in Section 1.6(a) (reduced, if applicable, pursuant to Section 1.6(b) hereof), PLUS an amount equal to one-half of the amount of the annual Base Rent for the Expansion Space contained in Landlord's Proposal (as hereafter defined), but if the provisions of Section 1.6(b) are then applicable, then only one-twelfth of the such annual Base Rent for the Expansion Space. Tenant shall deliver to Landlord such replacement Letter of Credit for the reduced amount, but otherwise on the same terms and conditions provided in Section 1.6(a) hereof. Upon receipt by Landlord of such replacement Letter of Credit, Landlord shall deliver to Tenant the original Letter of Credit. In the event Tenant elects to deliver the Cash Deposit in lieu of or in substitution of the Letter of Credit, the Cash Deposit shall be deposited by Landlord into an account separate from all of Landlord's other accounts and into which Landlord shall not co-mingle any other funds. The Cash Deposit may be invested in any of the following: (i) U.S. Government obligations, (ii) securities as to which the principal and interest are unconditionally guaranteed by the United State of America, (iii) obligations of any corporation whose commercial paper is rated "A1" or "P1" by any Rating Agency, (iv) repurchase agreements fully secured by U.S. Government obligations, or (v) interest-bearing accounts, time deposits, and certificates of deposit issued by any bank, trust company or national banking association which has capital, surplus, and undivided profits in excess of $50,000,000.00, but Landlord shall not be liable for the performance of any such investment. The Cash Deposit may be applied by Landlord and Landlord shall be liable to Tenant for the application of all of any portion of the Cash Deposit in the same manner and to the same extent to the application by Landlord of Draw Proceeds above provide. To the extent (i) any investment of the Cash Deposit reduces the principal amount of the Cash Deposit, or (ii) Landlord applies any portion of the Cash Deposit to remedy any obligation of Tenant hereunder Landlord has right to so remedy, Landlord shall promptly notify Tenant of the same, in writing, and within fifteen (15) days following receipt of such notice, Tenant shall deposit with Landlord for deposit by Landlord in the separate account above provided the amount by which the original principal amount of the Cash Deposit was reduced as aforesaid. All interest earned on or gain realized on the investment as aforesaid of the Cash Deposit, after deducting the reasonable out-of-pocket cost and expense, if any, incurred by Landlord that is charged by any third party for making any of the foregoing investments shall be paid by Landlord to Tenant, not more frequently than annually during the Term, within thirty (30) days following Landlord's receipt of written request from Tenant for the payment of such interest or gain. SECTION 2.1 PLANS - CONSTRUCTION - COST OF WORK - TENANT IMPROVEMENT ALLOWANCE. (x) the Warranty Work (as hereafter defined) for the Initial Improvements. SECTION 2.2 COMPLETION OF IMPROVEMENTS. (a) COMPLETION DATE FOR INITIAL IMPROVEMENTS. Subject to Permitted Delays, Landlord shall cause the Initial Improvements to be Substantially Complete not later than ___________. (vi) any extension of time permitted to Contractor under the terms of the Contractor's Contract (as hereafter defined) or the contractor retained to construct the Expansion Space under the terms of its contract. Landlord and Developer shall use and shall cause the Contractor to use and to cause all Construction Subcontractors to use their respective commercially reasonable efforts to prevent or minimize any delays resulting from any one or more of the matters described in clauses (i) through (vi), above. Any delays resulting from any one or more of the matters described in clauses (i) through (vi) above, except as may be due to the negligence of the Landlord, Developer, Contractor, any Construction Subcontractor or the contractor retained to construct the Expansion Space or their employees, agents or representatives, are hereinafter individually referred to as a "PERMITTED DELAY," and are hereinafter collectively referred to as "PERMITTED DELAYS." (c) EFFECT OF PERMITTED DELAYS. Promptly following Landlord or Developer becoming aware that an occurrence will result in a Permitted Delay hereunder, Landlord or Developer (in respect to the Initial Improvements only) shall notify Tenant, in writing, of such occurrence and of Landlord's estimate (Developer's estimate shall act as Landlord's estimate) of the effect, if any, such occurrence will have on the time within which the subject Improvements shall be Substantially Complete (and, as noted below, in the case of a Tenant Extension, the additional cost as a result thereof, if any, which Landlord believes should be borne by Tenant), and shall provide Tenant with reasonable evidence as to the Permitted Delay. The effect of any delays which result from a Permitted Delay, the date the subject Improvements would have been Substantially Complete but for a Tenant Extension and the cost, if any, to Tenant in the instance of a Tenant Extension, shall be the subject of a Change Order. In the event of any dispute between Landlord and Tenant of the occurrence of a Permitted Delay, the effect of such on the date of Substantial Completion of the subject Improvements or the increased cost applicable thereto as a result of a Tenant Extension, such dispute shall be resolved by the Construction Arbitrator as provided in Section 19 of the Work Letter. If there is a Tenant Extension, the Initial Term Commencement Date or, as applicable, the Expansion Commencement Date will occur on the date determined as aforesaid as a result of the Tenant Extension and the Initial Term and the Expansion Extension, respectively, shall begin to run on such determined date. Except for Tenant Extensions, in the event of the occurrence of any other Permitted Delay, the date on which the Initial Term Commencement Date (including the Delivery Date) and the Expansion Commencement Date shall occur and the date, respectively, on which the Initial Term and the Expansion Extension shall begin to run shall be the date of Substantial Completion of the subject Improvements.